I have blogged once or twice about the Grasshoppers of Bonnybridge, rightly so as they were the first football club in the district. But it is easy enough to find out about them, they have their own wiki page after all. Next to nothing is remembered of the second club in Stirlingshire - Midland Club of Greenhill. Greenhill is nowadays thought of as part of Bonnybridge, but it is not, and back in the mid 1870s there was definite green space [and foundries] in between the two villages. 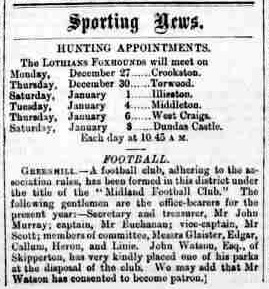 Midland Club unlike their Bonnybridge rivals were a very short-lived affair not surviving a calendar year, with next to no match results surviving. 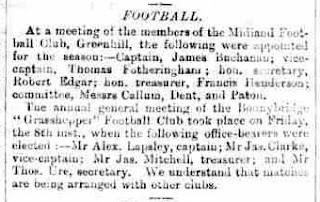 At the begining of the following 1876/77 season, the Falkirk Herald on 16th September 1876 reported a club meeting taking place. And that was the last I ever found anything on the club. Nothing.